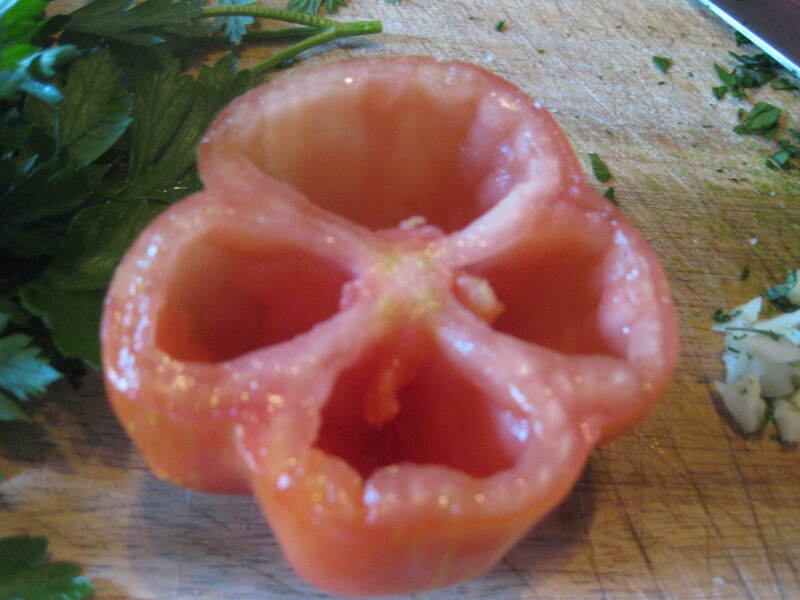 Cut the tomatoes in half. Remove seeds with your finger, then salt and pepper the halves lightly. Turn the halves upside down on paper towels so that excess juice drains. Meanwhile, puree the garlic: peel the cloves and dice them roughly. Then sprinkle with a pinch of salt. Mash them down with the flat of a big knife, until a fairly smooth paste is achieved. In a bowl, stir garlic, parsley, breadcrumbs, a pinch of black pepper and a drizzle of olive oil together. 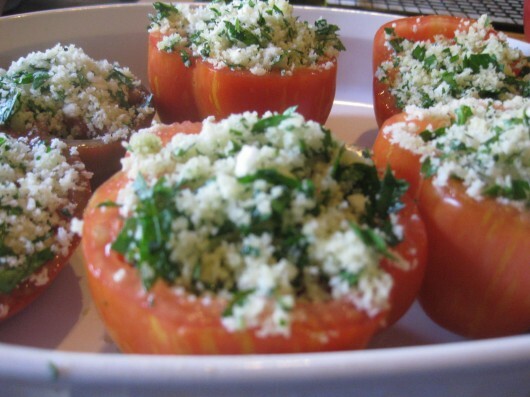 Spoon this mixture into the crevices of the tomatoes, leaving a mound of stuffing on top. Set tomatoes in a baking dish, and, if you are not going to bake them right away, cover with plastic wrap and refrigerate. Just before baking, drizzle tops with a little more olive oil. Then bake for exactly 20 minutes on the middle rack of your preheated, 400-degree oven. Does Your Dog Like Fresh Veggies, too? Yum-my! And it's easy enough for even me to make! I had forgotten about these, great easy idea! Katreader – now, we simply HAVE to come up with a non-tomato-sauce recipe that you will send you over the moon! Judy and Janice – Yes, very, very easy to make and (almost) everybody loves them! I have so many ripe tomatoes now, and will definitely make this recipe. I'm making these for my party…it's going to be smaller, all finger foods. Using cherry tomatoes.